Is the continuing prosecution of Eva Ruiz Gomez an intelligent use of court time? NO. Is it the best use of Monterey County taxpayer money? NO. a custody hearing that was set up and held without her knowledge. Why did she not know about the hearing? Because she was living in Mexico and was never properly notified. This woman is not a criminal. Eva is the hard-working, loving and conscientious mother of three children. She has a daughter in her third year of college, a son in his first year of high school and a 3-yr-old daughter. She has a devoted husband of 10 years, who works 2, sometimes 3, jobs to provide a decent life for their family. She has no prior record of breaking any laws. and imprisoned for three years. 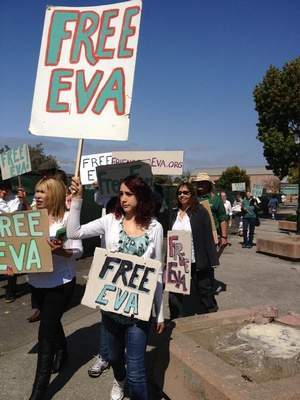 Ten years ago, the Monterey Superior Court gave Eva full legal and physical custody of her son. And they gave her permission to move to Mexico with him. After seven years of running a successful business in San Miguel de Allende, Eva and her family returned to the Monterey Peninsula for a temporary stay. this man has been allowed to fall $28,000 behind in child support payments while he pursues an endless string of frivolous legal filings against Eva. Mr. Flippo, why is the Monterey Superior Court coddling a deadbeat dad while it persecutes a hard-working mother? Why do the courts look away while a deadbeat dad spends his money on attorneys instead of the $28,000 he is court-ordered to pay in child support? two which Eva followed and one unknown to her until her arrest. but almost weekly she is forced to appear in court. Over sixty hearings so far, and another one scheduled tomorrow. This is a civil dispute that should never have been made subject of a criminal prosecution. 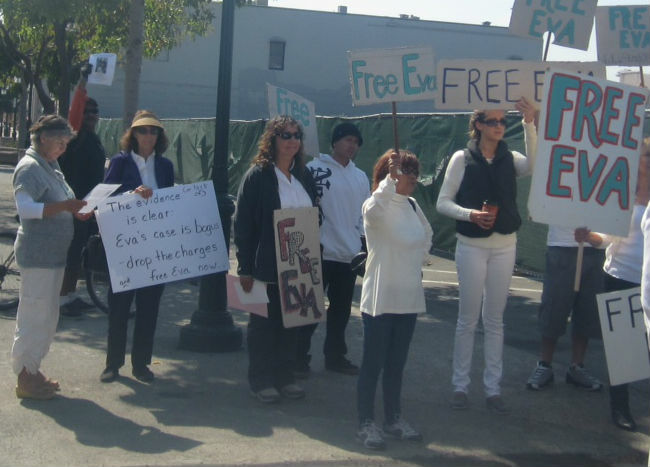 Since the day of Eva’s arrest in 2010, hers and her family’s lives have been turned upside down in an irreversible way. They are daily and constantly under enormous stress. They have been pushed to the edge of financial ruin, borrowing thousands of dollars to keep Eva’s defense going. With Eva caught in the court system, her family’s lives are in limbo. They are unable to return to their beloved Mexico. They are being driven into a pit of stress and debt as they fight to keep Eva out of prison. Yet two years into this case, the prosecutor has never told which court order Eva violated. Mr. Flippo, we ask you to spell out exactly how Eva violated a court order, and which order she violated. We ask you to look closely at the documents and evidence of this case. And then, Mr. Flippo, we urge you to DISMISS ALL CRIMINAL CHARGES AGAINST EVA RUIZ GOMEZ. This woman is not a criminal. Give her back to her family, and give them back their lives. 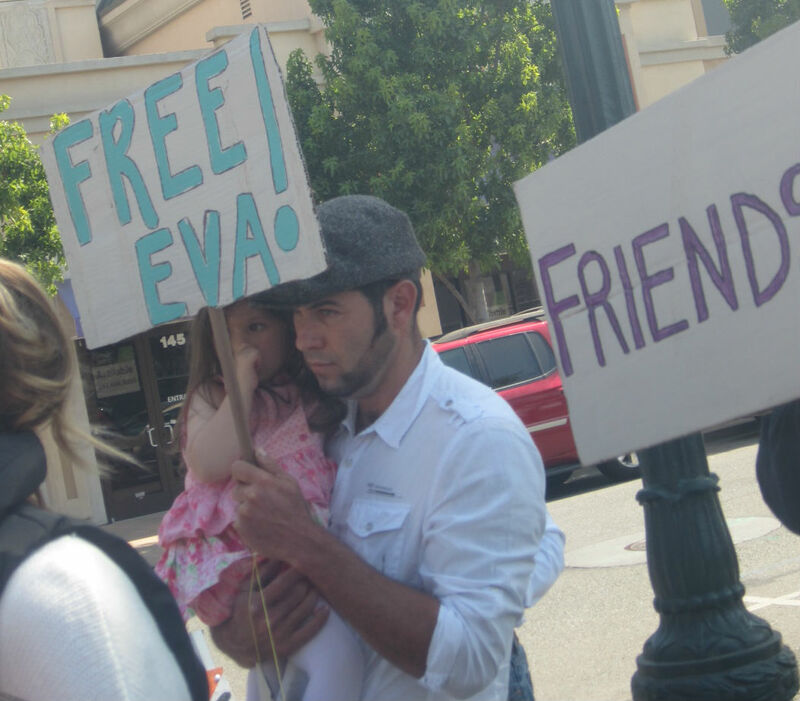 FREE EVA! EVA LIBRE!